Published on April 20, 2009 in Events. 3 Comments Tags: eCentral, event, GameJam. 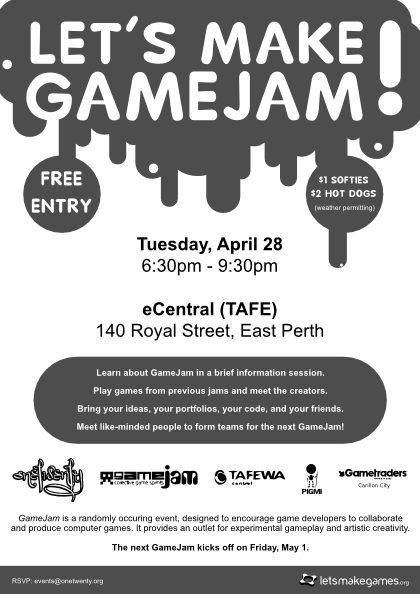 The next Perth GameJam will kick off next Friday (May 1). With that in mind, this month’s event will be an opportunity to learn about GameJam, play previous entries, and find some like-minded people to jam with! There will be computer labs available for people to show off their portfolios and previous work. We’d like to extend a huge thanks for eCentral TAFE for providing the venue. Please be sure to RSVP so that we can arrange for drinks ($1 softdrinks) and food ($2 hotdogs: meat or vegetarian) weather permitting. I’ll be there (RSVPing on FB now).